Chapter Four - Say Cheez! Chapter Three: The winter of '06 -'07 when not much happened. Our Say Cheez! adventure won't be resumed: at least not this season. The three of us are in Gainesville with Judy's dad, and even though he's recovering nicely from a quadruple bypass operation, we don't expect to get back on the road this fall. Wisconsin was great fun, but we missed the places we wanted to visit along the western shore of Lake Michigan. I hope we'll be able to pick up where we left off, but it probably won't be next summer. Our plan was to visit Wisconsin this summer and go east into New York State and Ontario next. Even though this tour is unfinished, I expect we'll keep to that schedule. Our return will likely have something to do with Traverse City, MI. We love the TC area and want to visit again. 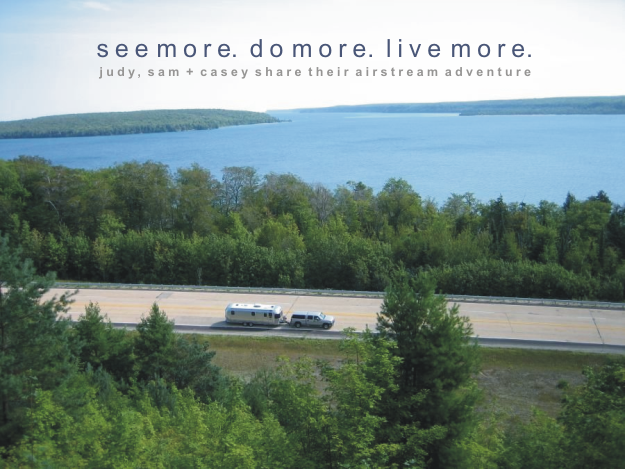 When we do it's little more than a day's drive across the Upper Peninsula to Door County, WI. Before you read about a follow-up Wisconsin visit, however, we hope you'll say "Howdy" to Chapter Five when we saddle up and head to the Texas Hill Country and other destinations in the southwest. Look for it on a computer near you in January, 2008. Yesterday we arrived in Oshkosh and planned to visit Experimental Aircraft Association museum today. It was not to be. As we were entering the museum Judy received a telephone call that her father is in a Gainesville, FL hospital. We returned to the campground, hooked up the trailer, and moved to Milwaukee so she can catch an early morning flight to Gainesville. Casey and I will drive back to Tryon. You can reach either of us on our cell phones. Otherwise, I'll post an update here when we cut the cheese again. You'll absolutely need one of these when you see the Wisconsin Concrete Park. We couldn't make up this stuff. According to the web site, Fred Smith, a retired lumberjack, created 237 concrete pieces for his concrete park -- they carefully shy away from the question, "why?" And a final 'Crowd Shot.' If you want to see more (and that's certainly understandable) there's a trip to Phillips, WI in your future. One caveat: The elegant animal in the left foreground may not be there when you visit. What a difference a day makes. Yesterday we wallowed in the urban delights of Duluth, and today we're immersed in the pristine splendor of the Apostle Islands National Lakeshore. Our world changed in a 90-minute drive. 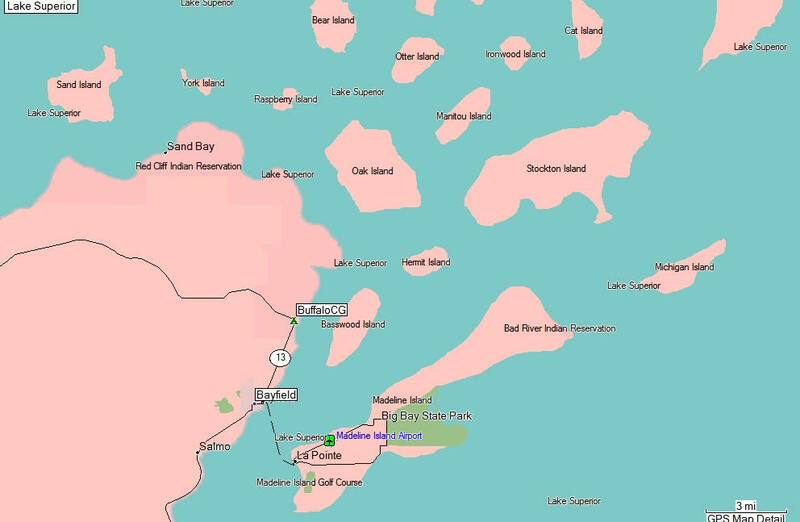 Camped in the reservation campground of the Red Cliff tribe of Chippewa Indians, we're overlooking a archipelago of islands extending as far as the eye can see into Lake Superior. If there's a special heaven for boaters it couldn't be any better than this. There are sailboats, cruisers and kayaks everywhere. Here's a close-in map of the area. (Click on it to see a larger version.) 'BuffaloCG' is our campground. You can put this into perspective with reference to our other stops by clicking on the USA map in the right-hand column. This morning we had a delightful walk around Bayfield. It's a thriving town of 611 permanent residents and hordes of summer visitors. Although we visited on a Saturday morning in August, it wasn't unpleasantly crowded. Rather, it felt successful. Most visitors come to Bayfield for shopping, to catch the tour boat for a cruise around the Apostle Island's eight historic lighthouses or to sail their own boats out of the city marina. The town does a great job offering all of these. We questioned the Dock Master about the large number of Minnesota license plates in the marina parking lot since many Lake Superior launching points are much closer to them. He told us that most of his customers drive about four hours from the Minneapolis/St. Paul area. That makes the round trip pretty much a full day's drive. Wonder if they come for a normal two-day weekend? Accounts for 10% of the world's fresh water. Large enough to contain all the other Great Lakes, plus three additional lakes the size of Lake Erie. With the entire surface frozen (which has only happened twice), there would be enough room for every person on earth to spread out a 12' x 12' picnic blanket. Now, that's a superior lake! 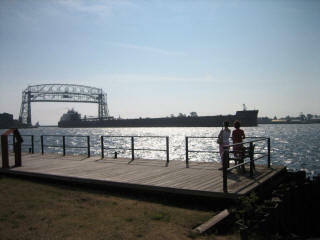 Duluth is a terrific little city! The residential areas on a hillside overlooking the bay remind us of San Francisco, and the fantastic gardens in the bayside parks remind us of Halifax, NS. The trendy shops and restaurants remind us of all the college towns we've loved. It's such a wonderful surprise! We arrived last Tuesday after a short drive from Chippewa Falls, and will leave tomorrow. Wish we had planned for a longer stay, but had no idea it would be so nice. Our campground is in Superior (a misnamed town), but that's OK because it's very close to Duluth. Duluth, Minnesota and Superior, Wisconsin share, and are separated, by St. Louis Bay, on Lake Superior. It's one of the most important shipping ports in the USA, and the world's largest harbor. Producing areas send their corn, coal, lime rock, forest products, concrete and taconite (used to make steel) here by truck and train, where they are loaded onto huge lakes freighters for transport through the Great Lakes to US and foreign ports. 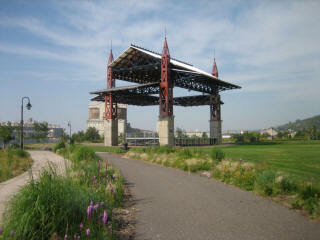 We're in Bayfront Festival Park looking toward Lake Superior. The 1,000' freighter has just come under the world's tallest lift bridge into St. Louis bay on it's way to one of the many loading docks. 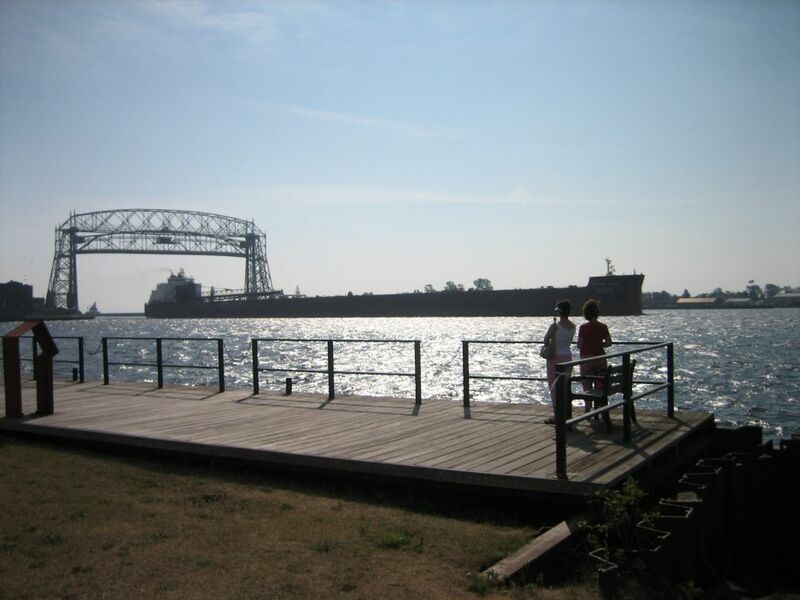 Duluth is running neck-and-neck with Traverse City, MI as our favorite city to spend a summer. La Crosse has nice parks along the riverfront, but dogs are prohibited in all of them. We don't resent the city, and it's certainly not the dog's fault. We do blame irresponsible owner's who don't clean up after their dogs for ruining it for those who do. It was a wonderful park where Casey had a great time running free. We toured the brewery and tasted six of their offerings. The premium product, La Crosse Lager is OK.
At the Circus World Museum we had an interesting talk with a calliope mechanic. He confused us, however, by referring to the instrument as a kăl'ē-ōp' (cally-ope) because we've always pronounced it kə-lī'ə-pē' (cal-eye-oh-pee). When we asked about his pronunciation, he told us that calliope is pronounced 'cally-ope' in the circus, and 'cal-eye-oh-pee' on river boats. Written by Judy & Sam on Thursday, July 26, 2007 - Posting somewhat delayed. Below is a photo of the Two Hemisphere Wagon, the largest parade wagon ever built. It carried an orchestra behind a team of 40 Percheron draft horses. Can you imagine a four-wide, ten-deep team of huge draft horses? I would be thrilled to tears. If you enlarge this one (by clicking on it) you can see that the little boy just in front of the heel is giving the audience a Raspberry. It's a bit difficult to see, but I had plenty of time for intense study. He really does have his thumb up to his nose and his hand is extended. What was Ringling Brothers saying? We also saw a neat little live circus show with elephants, clowns, illusionists, little people and acrobats. The legend of elephants and other circus animals parading to work is a myth. 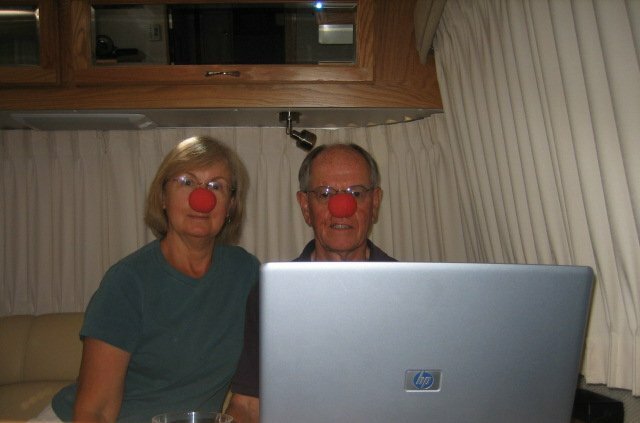 As you can see in this photo, the circus sent limos for them. 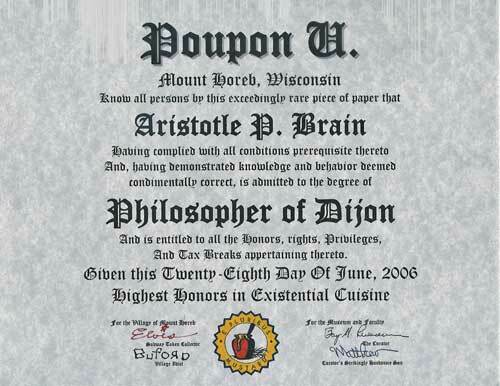 Yes, Wisconsin cuts the cheese, but Mt. Horeb really cuts the mustard! 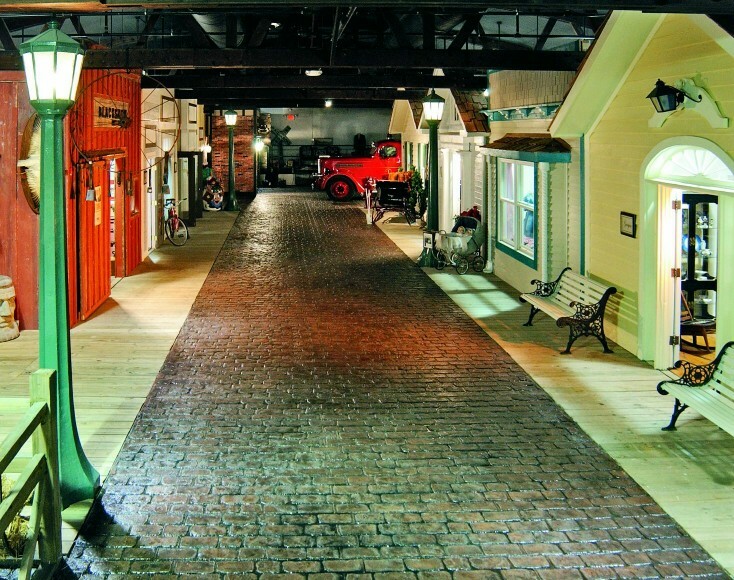 It's home of the world renown Mustard Museum. 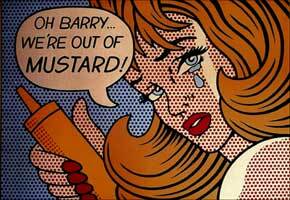 As we arrived the 'Mistresses of Mustard' had just installed the 4,800th jar, and was plenty chuffed about it. We played along acting real excited, but, as I said to my Missus, "Missus, 4,799 would be plenty for me." Of course, that's only because the museum is free. Whack on a tariff and I want to see every last jar. After viewing the Mustard Piece Theatre production of "Mustard: The fountainhead of civilization," we toured Poupon U (say it aloud). 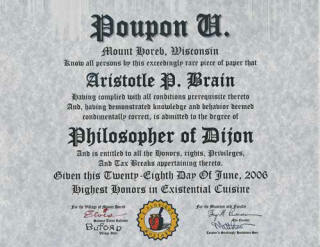 An impressive range of degrees are conferred at this prestigious institution, including the Ph.D. I wonder if they'll find the ketchup packet I hid between the 2,756th and 2,757th mustard jar? Here we are trolling for a little extra cash by posing for tourist photos on the Mt. Horeb Trollway. Don't know if it's Judy's fashion shades or my red beret, but you can see from our cheesy grins that we're really raking it in. With 14 trolls residing on it's downtown Trollway, Mt. 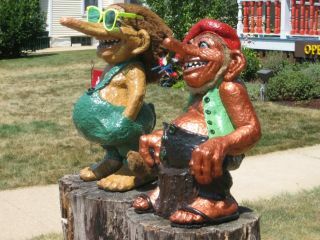 Horeb boasts of being the troll capital of the USA, and, possibly, the world. All of them are (much) better looking than the two above. Click on the photo of us to see the others, and to learn a bit more about them. Local knowledge is invaluable to us in deciding where to go and what to see. On this stop we received two pieces: took one and ignored the other. Big mistake -- we got it backwards. Here's how the first mistake unfolded: Earlier this week Tryon friends, Lois and Alan Merrill, who formerly lived very near Taliesin East were overnight guests of their former neighbors, Carla and John Lind. 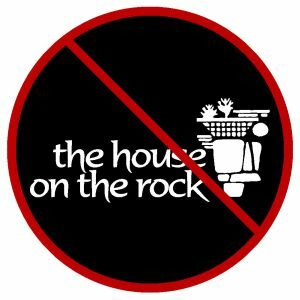 The Lind's included us in a wonderful dinner at their exquisite farm, Thistle Hill, and during it we were explicitly warned to avoid a very popular local attraction, The House on The Rock. We didn't listen but should have. It's a truly dreadful place -- a living monument to kitsch. I expect that, sadly, it has more visitors than Taliesin East. Such is the taste of the American public. Give The House on The Rock a pass when you're next through here. In her inimitable style, Judy labeled it "The Overlooked Overlook." 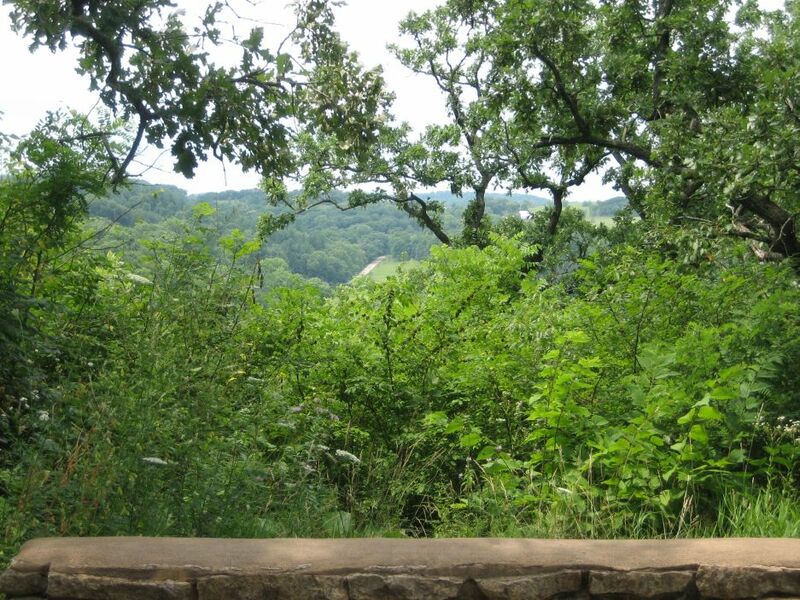 Not so poetic but also apt would be "The Overgrown Overlook." We'll continue to seek out local knowledge even though it won't always be helpful. Thursday we spent a wonderful afternoon at Taliesin East, Frank Lloyd Wright’s summer home and studio for 48 years. Taliesin is a beautiful home, but more than that, it was a working laboratory where he constantly demolished and rebuilt: experimenting with many innovations. It embodies his “organic” architecture more than any other building. FLW, a native of this area, is recognized by The American Institute of Architects as “the greatest American architect of all time.” His organic philosophy emphasizing harmony between buildings and their natural surroundings has had a significant impact on how we experience architecture. The architect’s 70-year career produced over 1,100 projects. FLW frequently designed total environments for his clients, including furniture, textiles, dinnerware, art glass, and lighting. He would then arrange the objects in the new home and defy the owners to move anything. He enforced his mandate with personal inspections. 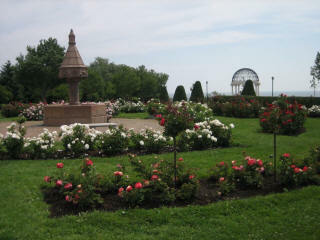 If any object had been moved, it was replaced by Wright and the owners received a scathing rebuke. 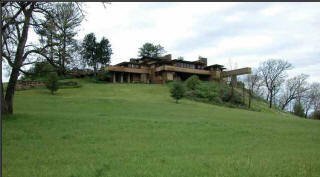 When he died in 1959 FLW was buried on the grounds of Taliesin East. His mistress, however, wanted him cremated and his ashes scattered along with hers at Taliesin West in Arizona. When his family wouldn't agree to her plan, the mistress had FLW exhumed and cremated at night and in secret. Because he wanted to make constant changes to Taliesin East, FLW refused to use quality building materials. He thought of it as a design laboratory, not a house built to endure. This has created enormous problems for the foundation that's trying to preserve the structure. Taliesin East is actually Taliesin East III. It burned twice while FLW lived there. One fire was arson by a disgruntled servant. The house has extremely low ceilings in some rooms, particularly around a room's perimeter. FLW did this to force guests to sit down and look out the windows (which were also made low). Low ceilings may have been problematic to tall guests, but not to FLW: he was only 5' 6". One of FLW's architectural precepts was to slow visitor's entry into the house so they would be forced to enjoy the exterior. At Taliesin West he accomplished this, in part, by hiding the front door and by moving it three times. Judy loved the place, and is ready to move in. You can see her photographs, and others I 'borrowed' from the internet by clicking here. Each of these elegant wind turbines stands on a 215 foot tower and has three blades that are 110 feet long. The blades turn rather slowly: their maximum speed being only 22 rpm. They begin generating electricity at a wind speed of 9 mph when the blades are rotating at 14 rpm. Looking past the handsome brute you will see 20 turbines. It's the largest wind farm in Wisconsin (it may be the only one for all I know, but the publicity says it's the largest). At any rate, the field can generate enough electricity to supply about 10,500 homes. We were quite taken by the silent grace of the farm, and although I know there are detractors, it certainly seems to be a safe, non-polluting source of energy. There's not much left in Delavan, but Judy did get this photo of our brave mutt drinking from the Lion's mouth. During the next few days we'll also visit the nearby town of Baraboo, which is home of the Circus Museum. Neither rain nor snow, nor plunge into the lake will stay these couriers . . . The 75' U.S. Mail boat, Walworth, approaches the private pier on Lake Geneva at an aggressive five knots. Any slower and she would lose steerage and crash into the pier. The nimble '20's-something' mail girl jumps out the passenger-side window clearing four feet of cold water to land safely on the narrow pier, but her momentum carries precariously close to the edge, and she escapes a bath only by grabbing a piling at the last moment. Dodging chairs and other water-toy obstacles she races toward the rural mail box at the head of the pier while the Walworth surges relentlessly on. Reaching her target, the mailgirl yanks open the door, extracts outgoing mail, rams in incoming mail, slams the door, and glances in panic at the retreating Walworth. With mail clenched in her teeth, she races back down the pier toward a desperate leap onto the Walworth's disappearing stern. She makes it . . . but only by a toe. Her first delivery complete, the Lake Geneva mailgirl will relive the exhilarating adventure another hundred times or so during the following two hours. Mail and newspapers are delivered seven days a week, but the work is so strenuous that eight mailgirls work in rotation. Note to Bonnie: This is a perfect post-retirement summer job for you. It was an exciting morning! We were right up front in the first two starboard (right-hand) seats of the Walworth for the mail delivery adventure. It's no exaggeration to say that each stop was scarier than the last. I can't imagine how dangerous it must be in rain. Given the small amount of mail that's delivered, it would be much safer to do it in a small runabout. That's a naive suggestion, however, because the big money comes not from the USPS contract, but from 120 passengers paying $23 a head. The Walworth is normally full. While the mail delivery was fun to watch, our main objective was to see the homes and antique boats along the 22 mile shoreline. They're worth seeing. This example is, admittedly, the high water mark, but there are many more -- some are extravagant, some are beautiful, a few are both. We've created a separate photo page of Lake Geneva homes and boats that you can view by clicking here. Living in sin . . .
Wisconsin, that is. Friday we settled into a campground near Lake Geneva after a 955 mile trip over five days. Travel time was four days, but we stopped for a day to play and rest at the Kentucky Dam Village State Resort Park. Our stop was a nostalgic return to Kentucky Dam. We were last there about 30 years ago with family, and on that visit were able to scramble right down onto the lock to watch tows of coal barges locking through from the Tennessee River into Kentucky Lake, and vise versa. It was an exciting day for us, and one we expected to relive. Alas, it was not to be. Those days of "Y'all come take a look" cordiality has been replaced by fence, razor wire and guards. Our only access was to the Visitor's Center. It's probably a result of 9/11, and understandable, but we were nonetheless disappointed. Yesterday we did a driving tour of the area and visited the Lake Geneva Museum. The interior street scene you see here is very well done. Today we look forward to touring Lake Geneva by boat. The town bills itself as 'The Newport of the West,' and from the photographs we've seen of the mansions ringing the lake, it may very well be true. We'll fill you in tomorrow. 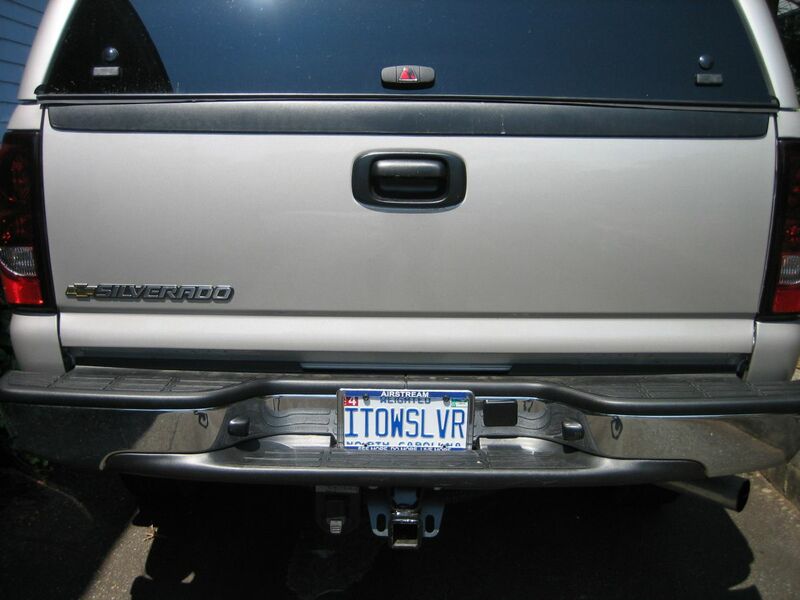 ITowSilver . . . Awaaay! Tomorrow begins a new chapter in our Airstream adventure. Last summer's trip (Chapter Two) was so delightful it inspired us to cross the lake this year to visit America's Dairyland. The plan is to hot foot it straight to Wisconsin, but since we tow at a blistering 60 mph, and frequently stop to play, 'hot foot' is a bit grandiose. Four days should do it. Once there, we'll do a serpentine 1,000+ mile tour with an extensive list of 'Must See's' thanks to our friend Lois Merrill's tips, and Judy's exhaustive research. I won't give it all away now, but look forward to inspiring reports from the Concrete Museum and the Mustard Museum. Obviously, you're thinking, "Wisconsin, that's Spam and the Weiner Mobile." Could be, but these are hard tickets to score. Not just everyone gets to ride in the Weiner Mobile. After wearing out our welcome in Wisconsin we'll return to Michigan via the Upper Peninsula to relive some of last year's fun. 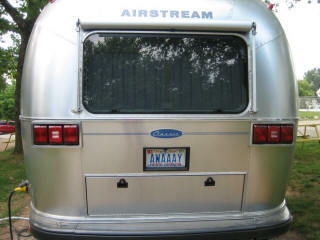 Late in the summer we hope to visit friends and, perhaps, join the Michigan State Airstream Rally. On the way back to Tryon we expect to detour through western Pennsylvania to see the Frank Lloyd Wright houses Fallingwater and Kentuck Knob. That's it for now. More from the road. P.S. I wanted to introduce our Say Cheez! 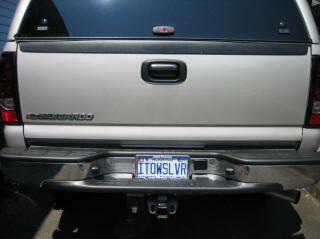 trip to Wisconsin by entitling this post ITowSilver... Awhey but wasn't permitted to punish you in the first post. I deferred only because she won't be able to edit every one that follows.